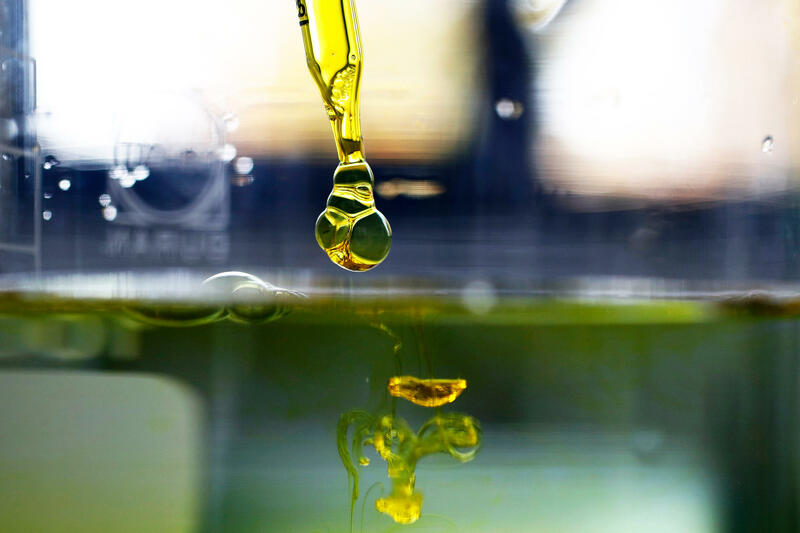 A sample of cannabidiol (CBD) oil is dropped into water. Supplements containing the marijuana extract are popular and widely sold as remedies for a variety of ailments and aches. But scientific evidence that they work hasn't yet caught up for most applications, researchers say. Former Denver Broncos quarterback Jake Plaummer takes a dose of cannabidiol in Colorado in 2016. 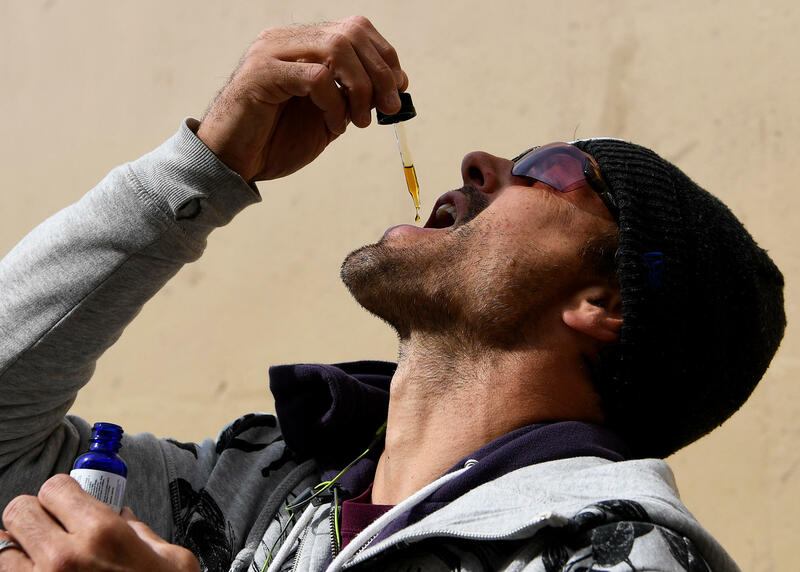 CBD oil, often dispensed under the tongue with a dropper, has been regulated as a supplement in the U.S., not a medicine. So strength and purity may vary from brand to brand, or even bottle to bottle, scientists say. The Marijuana Business Conference & Expo in Chicago in 2015 displayed oil containing CBD extracted from agricultural hemp. Today CBD oil alone is estimated to be a $200 million industry. 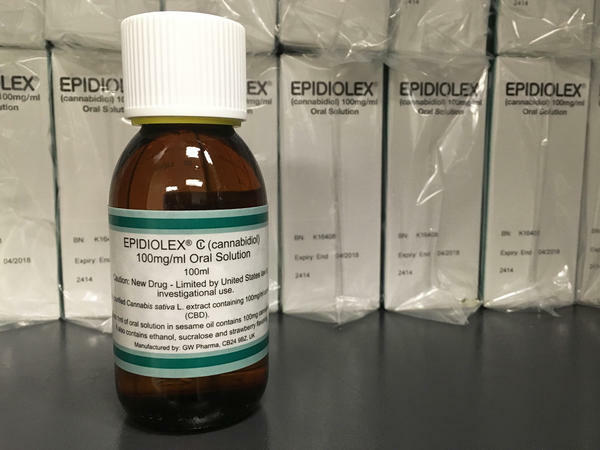 GW Pharmaceuticals makes Epidiolex, a medicine containing pharmaceutical-grade CBD. Last week, a panel of FDA advisers recommended approval of the drug to treat severe seizure disorders in children. "My customers are buying CBD [for] stress relief," says Richard Ferry, the retail manager of Home Grown Apothecary in Portland, Ore., where recreational marijuana use is legal under state law, with some restrictions. Another rationale Ferry's heard from clients about their CBD use: "Their mother-in-law is in town, and they just want to chill out!" 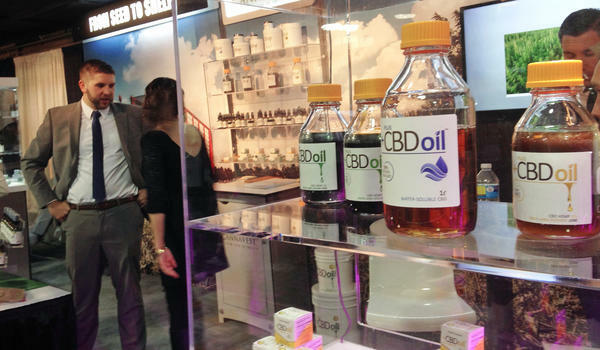 By one estimate, the CBD industry has doubled in size over the last two years, and is now worth $200 million. But with this popularity the hype may have gotten ahead of the science. And there's another issue would-be users face: Though CBD supplements are widely available for sale, a legal murkiness surrounds marijuana extracts. The movement to legalize marijuana in many states has led to more interest in a product that is derived from cannabis. It's called CBD, and it's widely available online. Research suggests it may help to relieve pain and anxiety and other disorders. NPR's Allison Aubrey reports. ALLISON AUBREY, BYLINE: Richard Ferry is the retail manager of the Home Grown Apothecary in Portland, Ore., where marijuana is legal. He says lots of his customers use CBD. RICHARD FERRY: CBD has gotten a lot of buzz. AUBREY: CBD, which is short for cannabidiol, is marketed as a way to relieve anxiety. And part of the appeal is that it doesn't have the same mind-altering effects as marijuana since it doesn't contain the psychoactive component. FERRY: And how do I sell it? All sorts of ways. AUBREY: So why all the interest in CBD? FERRY: My customers are buying CBD products because of stress relief, because of aches, because of pains, because their mother-in-law is in town and they just want to chill out. AUBREY: By one industry estimate, the CBD market has doubled since 2016. It's a $200 million industry, but with this popularity, the hype may have gotten ahead of the science. FERRY: There's a lot of confusion about how it works and what it does exactly. AUBREY: Turns out, there's a lot of new research into CBD. Esther Blessing is a psychiatrist at New York University. She now studies the compound. ESTHER BLESSING: There's really good evidence to suggest that CBD could be an effective treatment of anxiety and addiction, but we need clinical trials to find out. AUBREY: Blessing says so far the evidence comes from very small, short-term studies. She points to one from researchers in Brazil. BLESSING: They did a study in people with social anxiety disorder, and they gave them CBD before a speech in front of a large audience. AUBREY: The researchers compared anxiety levels in people after they took the CBD compared to a placebo. BLESSING: And they found that people who took CBD reported significantly less anxiety, which is really interesting. AUBREY: Blessing and a group of her collaborators are about to begin a clinical trial funded by the National Institutes of Health to test whether it can help people with PTSD and alcohol use disorder. Another study is looking at CBD's potential to prevent relapse in people who've been addicted to opioids. Now, it may seem counterintuitive that a compound in marijuana, a drug, could possibly be used to treat addiction to another drug. But Blessing says using CBD is not at all like using marijuana. It's extracted from cannabis, but it doesn't contain the psychoactive component that leads to altered perception and cognition. BLESSING: CBD does affect the brain, but it seems to affect the brain in possibly medicinal ways. AUBREY: That won't impair your thinking or make you feel high. Now, results from Blessing's clinical trial are a few years off, but in the meantime, just last week, advisers to the FDA approved the first pharmaceutical-grade CBD to treat severe seizures in children with epilepsy. Robert Carson is a neurologist at Vanderbilt University who has evaluated the effectiveness of CBD supplements. He says they can be beneficial, but he says an FDA-approved CBD drug would be more reliable than the supplements. RICHARD CARSON: We cannot guarantee what is in it. We cannot guarantee the consistency. AUBREY: Because supplements are not regulated like pharmaceutical drugs. And another issue - despite the fact it's widely available, a legal murkiness surrounds CBD supplements. Even if you live in a state where marijuana use is legal, the Federal Drug Enforcement Administration still considers the extract as a Schedule I substance, which is the most restricted category. Proponents hope the findings of studies that are underway now will help change the thinking about its legal classification and its potential benefits. Allison Aubrey, NPR News. (SOUNDBITE OF RATATAT'S "CREAM ON CHROME") Transcript provided by NPR, Copyright NPR.